The New Negress Film Society is a core collective of black women filmmakers whose priority is to create community and spaces for support, exhibition, and consciousness-raising. The group is formed by Frances Bodomo, Ja'Tovia Gary, Stefani Saintonge, Chanelle Aponte Pearson, and Dyani Douze. This year's program includes a screening series plus a conversation between collective members Ja'Tovia Gary and Chanelle Aponte Pearson. Together, they'll discuss the topic of black women's spectatorship and "looking relations," the significance of Black queer representation in cinema, and the goals, challenges, and achievements of a film collective dedicated to Black women's cinema. Ja'Tovia Gary is an artist and filmmaker originally from Dallas, Texas, currently living and working in Brooklyn, New York. Gary's work is concerned with constructions of power as it relates to shaping identity and how these power relations are made manifest in popular media and art. She is the recipient of the Sundance Documentary Fund Production Grant and the Jerome Foundation Film and Video Grant. Gary participated in the Terra Foundation of American Art 2016 summer artist fellowship and is the 2017 Remix Artist in Residence at the Jacob Burns Film Center. Chanelle Aponte Pearson is a Bronx-bred, Brooklyn-based visual artist and filmmaker. In 2015, Chanelle was awarded the euphoria Calvin Klein Spotlight on Women Filmmakers "Live the Dream" grant for the narrative series 195 LEWIS, her directorial debut. As chief operating officer, Pearson also oversees the management and operations of MVMT, a Brooklyn-based film production company. Cakes Da Killa No Homo is an electrifying portrait of a young artist determined to live life on his own terms. Born Rashard Bradshaw, Cakes Da Killa is a 22-year-old hip hop artist. As an openly gay man, he is not your run of the mill rapper, but he just might be your new favorite. 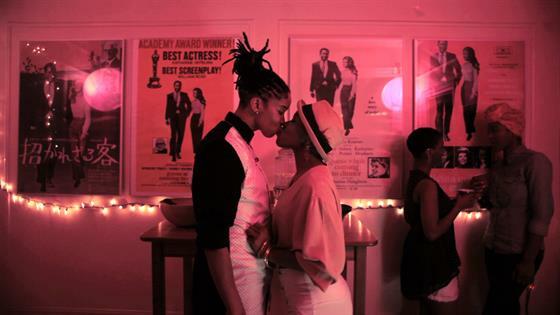 195 Lewis: POP Party is a dramedy series about a group of friends navigating the realities of being Black, queer, and polyamorous in New York City. This audiovisual project re-imagines the black body in pain as an agent of potentiality through art and collaboration. Everyone is growing up except Patrice. But when a raunchy rumor threatens her best friend's reputation, she's forced to join the party and embrace adolescence.